Pianta della Citta di Firenze. 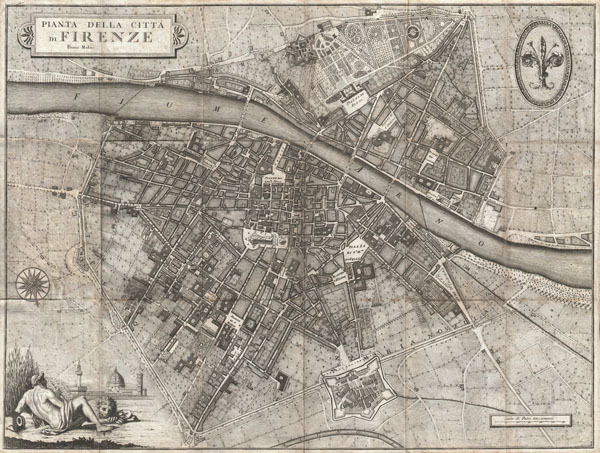 A rare and extraordinary 1847 map of Firenze or Florence, Italy by Giuseppe Molini. This magnificently engraved map was originally drawn in 1731 by the Florentine architect Ferdinando Ruggieri. Oriented to the south, the map covers the old walled center of Florence as it extends on both sides of the Arno River. Offers superb detail at the street and building level showing towers, gardens, piazzas, palaces and in many cases individual trees. The title appears in a decorative frame in the upper left quadrant. Upper right quadrant features the lily symbol of Florence. An allegorical title cartouche in the lower left quadrant depicts a partially disrobed man leaning against a large urn with a lion, a popular Florentine icon called Marzocco, as his companion. Behind him are tall reeds partially blocking a magnificent view of the Palazzo Vecchio and the Duomo. Though printed in 1847 this map has been prepared in the 17th century style, by copperplate engraving, on thick laid paper. Firenze in 1847 was on the cusp of political transformation. One year following the production of this rare map the Grand Duke of Tuscany, responding to political demonstrations throughout Florence, granted a Tuscany its first constitution. Giuseppe Molini (1772-1856) was a Florentine knight, bookseller, printer, publisher, bibliographer and librarian, active in the late 18th and early 19th century. Clients of Molini's Bookshop in Florence describe Molini as having "an open strongly-marked countenance", a "rare intelligence", and an willingness to share his bibliographical knowledge with any inquirer. The bookshop, a competitor of Galignani's, was located on the Via degli Archibusieri, near the Ponte Vecchio. Molini's Bookshop is known to have stocked a good selection of material in both English and Italian. His prosperous shop focused not only on the active tourist trade but also sold books to dignitaries and royal courts all over Europe. In addition to his retail establishment, Molini was the proprietor of All'insegna de Dante (Dante's Head Press) and Presso G. Molini, located at no. 823 Piazza di St. Maria in Campo. His publishing corpus includes numerous books ranging in scope from a history of Italy to a biography of the Italian artist Benvenuto Cellini. Molini closed his bookshop when he was appointed director of the Biblioteca Palatina which maintained the important book and manuscript collections of the Grand Dukes of Tuscany. Molini held this position until his death in 1856. Ferdinando Ruggieri (1691 - 1741) was an important Italian architect and artist active in Florence in the early part of the 18th century. Ruggieri was instrumental in developing and defining the Italian Baroque movement. His most important work is considered to be the stunning c. 1715 left façade of the Complesso di San Firenze, in Florence. His is also highly regarded for his design of the Palazzo di Gino Capponi in 1740. His cartographic endeavors include only one map, his important 1731 Pianta Della Citta di Firenze which would become the standard map of Florence for the next 150 years. Very good condition. Minor toning and wear along original fold lines. Folds into original marbled paper binder. Boston Public Library, Leventhal Map Center, G6714.F5 1847.M6. Boffito, A., Firenze nelle Vedute e Piante, p.78-9.